NDS358X IRD is DEXIN’s new design which integrates demodulation (DVB-C, T/T2, S/S2 optional), de-scrambler and multiplexing in one case to convert RF signals into TS output. It is a 1-U case which supports 4 tuner inputs, 1 ASI and IP. 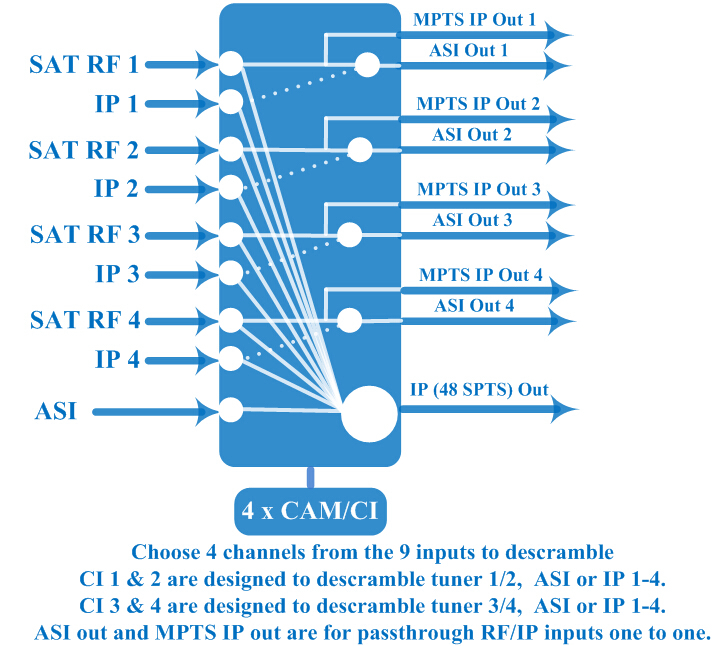 The 4 CAMs/CIs accompanied can descramble the programs input from encrypted RF, ASI and IP. The CAM requires NO unsightly external power cords, cables, or additional remote control device. BISS function is also embedded to descramble programs from any input. To meet customers’ various requirements, NDS358X is also designed to de-mux programs from any input, and output TS over 48 SPTS & 4 MPTS UDP, RTP/RTSP. NDS358X, ‘X’ should be interpreted as different digits which indicate tuners of different standard.